October 2018 in Argentina, more than 1,500 cooperative members and representatives of organisations and institutions linked to cooperatives from all around the world met at the “V Cooperative Summit of the Americas”. 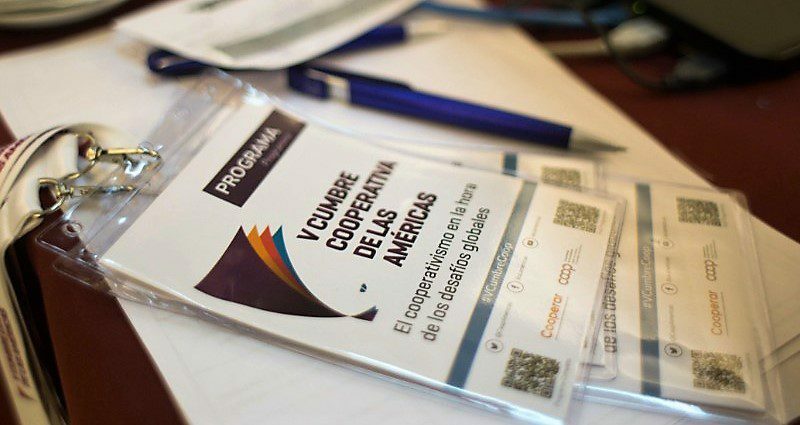 Under the slogan “Cooperativism at the hour of global challenges”, the participants have been debating and building agreements for three days, gathered in a final document called the “Declaration of Buenos Aires”. “Based on the transformations that have occurred in the world of work on a global scale in the last 10 years, CICOPA and the cooperative movement raise, together with the International Labour Organization (ILO), the importance of discussing what the characteristics of this change are and how it influences our companies and societies. As well as what the ways are for worker cooperatives and self-managed companies to evolve without losing sight of the democratic operation and the solidarity that characterizes them. Following the workshop, CICOPA Americas hold an ordinary Assembly that gathered members from Brasil, Argentina, Colombia, Canada, USA, Mexico, Uruguay, Paraguay and Chile. CICOPA President Manuel Mariscal, from Spain, and CICOPA Data Analyst Hyungsik Eum were also attending the meeting. During the Summit, 20 cooperatives and cooperative groups established an International Cooperative Entrepreneurship Think Tank (ICETT). Innovation, competitiveness, research, education, economic impact…but above all inter-cooperation were the topics discussed. The meeting was moderated by Javier Sotil, former President of the Mondragon Corporation who offered a view of the global challenges cooperative enterprises are facing. The objective of the ICETT is to serve as a strategic hub at the service of the cooperative movement to strengthen the entrepreneurial performance of cooperatives. Participants emphasized that in addition to the inter-cooperation and exchanges among large cooperatives and cooperative groups, the ICETT also needs to work for answering the issue of how cooperatives should show their social impacts by using appropriate concepts and tools beyond conventional economic indicators.